Excellent Condition! 1 OWNER! Dodge Certified. PRICE DROP FROM $19,499, EPA 25 MPG Hwy/17 MPG City! Third Row Seat, Rear Air, iPod/MP3 Input, Back-Up Camera, Power Fourth Passenger Door, Dual Zone A/C, CD Player, Power Liftgate CLICK ME! SHOP WITH CONFIDENCE AutoCheck One Owner 7-Year/100,000-Mile Powertrain warranty, 125-Point Inspection and Reconditioning, Introductory 3-month subscription to SiriusXM® Satellite Radio, Carfax Vehicle History Report, 24-Hour Roadside Assistance, 24-Hour Towing, Rental Car, 3-Month/3,000-Mile Maximum Care Coverage AFFORDABILITY Was $19,499. KEY FEATURES INCLUDE Third Row Seat, Quad Bucket Seats, Power Liftgate, Rear Air, Back-Up Camera, iPod/MP3 Input, CD Player, Aluminum Wheels, Dual Zone A/C, Power Fourth Passenger Door. Rear Spoiler, Privacy Glass, Remote Trunk Release, Keyless Entry. OPTION PACKAGES ENGINE: 3.6L V6 24V VVT FLEXFUEL (STD), TRANSMISSION: 6-SPEED AUTOMATIC 62TE (STD), QUICK ORDER PACKAGE 29P SXT Engine: 3.6L V6 24V VVT FlexFuel, Transmission: 6-Speed Automatic 62TE, Black Finish I/P Bezel, Bright Side Roof Rails, Uconnect Voice Command w/Bluetooth, Fog Lamps, Bluetooth Streaming Audio, Power 2-Way Driver Lumbar Adjust, Integrated Roof Rail Crossbars, Leather Wrapped Steering Wheel, SIRIUS Satellite Radio, For More Info, Call 888-539-7474, Leather Wrapped Shift Knob, Highline Door Trim Panel, Rear View Auto Dim Mirror w/Microphone, Automatic Headlamps, Premium Interior Accents, Remote Start System, Remote USB Port, Bright Belt Moldings, Power 8-Way Driver Seat, Security Alarm, Security Group, Uconnect Hands-Free Group. One Owner. Pricing analysis performed on 2/4/2019. Horsepower calculations based on trim engine configuration. Fuel economy calculations based on original manufacturer data for trim engine configuration. Please confirm the accuracy of the included equipment by calling us prior to purchase. $1,700 below Kelley Blue Book! EPA 31 MPG Hwy/22 MPG City! Jeep Certified! Excellent Condition, 1 OWNER, GREAT MILES 22,500! Back-Up Camera, iPod/MP3 Input, Bluetooth, TRANSMISSION: 9-SPEED 948TE AUTOMATIC... ENGINE: 2.4L I4 MULTIAIR READ MORE! KEY FEATURES INCLUDE Back-Up Camera, iPod/MP3 Input, Bluetooth, Aluminum Wheels Rear Spoiler, MP3 Player, Keyless Entry, Privacy Glass, Child Safety Locks. OPTION PACKAGES ENGINE: 2.4L I4 MULTIAIR Tigershark, TRANSMISSION: 9-SPEED 948TE AUTOMATIC (STD). Jeep Latitude with Granite Crystal Metallic Clearcoat exterior and Black interior features a 4 Cylinder Engine with 184 HP at 6400 RPM*. Non-Smoker vehicle, One Owner, 125-Point Inspection and Reconditioning, Local Trade. EXPERTS ARE SAYING The Cherokee features one of the better backseats in the compact crossover class. Not only does it recline, but it also provides for fore-and-aft adjustment Great Gas Mileage: 31 MPG Hwy. AFFORDABLE This Cherokee is priced $1,700 below Kelley Blue Book. SHOP WITH CONFIDENCE AutoCheck One Owner Rental Car Allowance, Lifetime Certified Warranty Upgrades Available, 24-Hour Roadside Assistance, 24-Hour Towing, 3-Month/3,000-Mile Maximum Care Coverage, 7-Year/100,000-Mile Powertrain Limited warranty, Introductory 3-month subscription to SiriusXM® Satellite Radio WHY BUY FROM US At Waconia new and used Chrysler, Dodge, Ram and Jeep dealership. Has been a locally owned and operated family business since 1965. We strive to exceed your expectations. With a knowledgeable sales team, large inventory and everyday low prices, Waconia is the only place you will need to shop for a new or used car by Chrysler, Dodge, Ram or Jeep. Pricing analysis performed on 3/7/2019. Horsepower calculations based on trim engine configuration. Fuel economy calculations based on original manufacturer data for trim engine configuration. Please confirm the accuracy of the included equipment by calling us prior to purchase. Excellent Condition! ALL 4 NEW TIRES! Trailhawk trim. Jeep Certified. iPod/MP3 Input, Keyless Start, Bluetooth, ENGINE: 2.4L I4 MULTIAIR, TRANSMISSION: 9-SPEED 948TE AUTOMATIC... Aluminum Wheels. REDUCED FROM $20,988! AND MORE! BUY WITH CONFIDENCE 125-Point Inspection and Reconditioning, Rental Car Allowance, Lifetime Certified Warranty Upgrades Available, 24-Hour Roadside Assistance, 24-Hour Towing, 3-Month/3,000-Mile Maximum Care Coverage, 7-Year/100,000-Mile Powertrain Limited warranty, Introductory 3-month subscription to SiriusXM® Satellite Radio EXCELLENT VALUE Reduced from $20,988. KEY FEATURES INCLUDE 4x4, Back-Up Camera, Satellite Radio, iPod/MP3 Input, Bluetooth, Aluminum Wheels, Keyless Start. Rear Spoiler, MP3 Player, Keyless Entry, Privacy Glass, Steering Wheel Controls. OPTION PACKAGES ENGINE: 2.4L I4 MULTIAIR (STD), TRANSMISSION: 9-SPEED 948TE AUTOMATIC (STD). Jeep Trailhawk with Granite Crystal Metallic Clearcoat exterior and Black interior features a 4 Cylinder Engine with 180 HP at 6400 RPM*. Non-Smoker vehicle, One Owner, Local Trade, New Tires. EXPERTS RAVE It might look rugged on the outside, but on the inside the Renegade is comfortable and well-trimmed. The boxy shape and tall cabin mean lots of headroom and three-across seating is possible thanks to the exceptional width. -Edmunds.com. Great Gas Mileage: 29 MPG Hwy. BUY FROM AN AWARD WINNING DEALER At Waconia new and used Chrysler, Dodge, Ram and Jeep dealership. Has been a locally owned and operated family business since 1965. We strive to exceed your expectations. With a knowledgeable sales team, large inventory and everyday low prices Pricing analysis performed on 2/1/2019. Horsepower calculations based on trim engine configuration. Fuel economy calculations based on original manufacturer data for trim engine configuration. Please confirm the accuracy of the included equipment by calling us prior to purchase. Excellent Condition! 1 OWNER! Dodge Certified! PRICED TO MOVE $900 below Kelley Blue Book! JUST REPRICED FROM $20,999! 3rd Row Seat, Rear Air, iPod/MP3 Input, Back-Up Camera, Dual Zone A/C. FUEL EFFICIENT 25 MPG Hwy/17 MPG City! CLICK ME! KEY FEATURES INCLUDE Third Row Seat, Quad Bucket Seats, Power Liftgate, Rear Air, Back-Up Camera, iPod/MP3 Input, CD Player, Aluminum Wheels, Dual Zone A/C, Power Fourth Passenger Door. Rear Spoiler, Privacy Glass, Keyless Entry, Remote Trunk Release. OPTION PACKAGES ENGINE: 3.6L V6 24V VVT (STD), TRANSMISSION: 6-SPEED AUTOMATIC 62TE (STD), QUICK ORDER PACKAGE 29P Engine: 3.6L V6 24V VVT, Transmission: 6-Speed Automatic 62TE, Black Finish I/P Bezel, Bright Side Roof Rails, Uconnect Voice Command w/Bluetooth, Front Fog Lamps, Bluetooth Streaming Audio, Power 2-Way Driver Lumbar Adjust, Integrated Roof Rail Crossbars, Leather Wrapped Steering Wheel, Sirius Satellite Radio, For More Info, Call 888-539-7474, Leather Wrapped Shift Knob, Highline Door Trim Panel, Automatic Headlamps, Premium Interior Accents, Remote Start System, Remote USB Port, Bright Belt Moldings, Power 8-Way Driver Seat, Security Alarm, Security Group, Uconnect Hands-Free Group. One Owner, 125-Point Inspection and Reconditioning. AFFORDABLE 7-Year/100,000-Mile Powertrain warranty Reduced from $20,999. 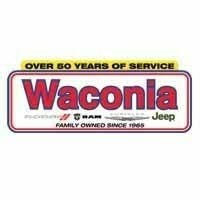 OUR OFFERINGS At Waconia new and used Chrysler, Dodge, Ram and Jeep dealership. Has been a locally owned and operated family business since 1965. We strive to exceed your expectations. With a knowledgeable sales team, large inventory and everyday low prices, Waconia is the only place you will need to shop for a new or used car by Chrysler, Dodge, Ram or Jeep. Pricing analysis performed on 2/1/2019. Horsepower calculations based on trim engine configuration. Fuel economy calculations based on original manufacturer data for trim engine configuration. Please confirm the accuracy of the included equipment by calling us prior to purchase. PRICE DROP FROM $28,186,1 Owner, Jeep Certified, EPA 30 MPG Hwy/22 MPG City!, $1,400 below Kelley Blue Book! Excellent Condition, Jeep Certified, ONLY 6,309 Miles! Heated Seats, iPod/MP3 Input, Back-Up Camera, Keyless Start SEE MORE! PURCHASE WITH CONFIDENCE AutoCheck One Owner 125-Point Inspection and Reconditioning, Rental Car Allowance, Lifetime Certified Warranty Upgrades Available, 24-Hour Roadside Assistance, 24-Hour Towing, 3-Month/3,000-Mile Maximum Care Coverage, 7-Year/100,000-Mile Powertrain Limited warranty, Introductory 3-month subscription to SiriusXM® Satellite Radio PRICED TO MOVE Reduced from $28,186. This Compass is priced $1,400 below Kelley Blue Book. KEY FEATURES INCLUDE 4x4, Back-Up Camera, iPod/MP3 Input, Bluetooth, Aluminum Wheels, Keyless Start. Rear Spoiler, MP3 Player, Keyless Entry, Privacy Glass, Child Safety Locks. OPTION PACKAGES TRANSMISSION: 9-SPEED 9HP48 AUTOMATIC, POPULAR EQUIPMENT GROUP Cluster 7.0 Color Driver Info Display, 115V Auxiliary Power Outlet, 7.0 Touch Screen Display, Rear View Auto Dim Mirror, Power 8-Way Driver/Manual 6-Way Passenger Seats, 4-Way Power Lumbar Adjust, COLD WEATHER GROUP Heated Front Seats, Reversible Carpet/Vinyl Cargo Mat, Windshield Wiper De-Icer, All-Season Floor Mats, Heated Steering Wheel, ENGINE: 2.4L I4 ZERO EVAP M-AIR W/ESS. Jeep Latitude with Granite Crystal Metallic Clearcoat exterior and Black interior features a 4 Cylinder Engine with 180 HP at 6400 RPM*. Non-Smoker vehicle, Originally bought here, One Owner. EXPERTS ARE SAYING Edmunds.com explains It rides well on the road, with carlike steering and brake inputs Great Gas Mileage: 30 MPG Hwy. Pricing analysis performed on 2/4/2019. Horsepower calculations based on trim engine configuration. Fuel economy calculations based on original manufacturer data for trim engine configuration. Please confirm the accuracy of the included equipment by calling us prior to purchase. Jeep Certified! Excellent Condition! All 4 NEW TIRES! FUEL EFFICIENT 28 MPG Hwy/21 MPG City! NAV, Heated Leather Seats, 4x4, Back-Up Camera, Dual Zone A/C, Remote Engine Start, Alloy Wheels, TRANSMISSION: 9-SPEED 948TE AUTO... Tow Hitch READ MORE! KEY FEATURES INCLUDE Leather Seats, 4x4, Heated Driver Seat, Back-Up Camera, Aluminum Wheels, Remote Engine Start, Dual Zone A/C, Heated Leather Seats. Rear Spoiler, Keyless Entry, Privacy Glass, Steering Wheel Controls, Child Safety Locks. OPTION PACKAGES RADIO: UCONNECT 8.4 NAV SiriusXM Travel Link, (Registration Required), HD Radio, GPS Navigation, SiriusXM Traffic, TRAILER TOW GROUP 7 & 4 Pin Wiring Harness, Trailer Tow Wiring Harness, Class III Receiver Hitch, Full Size Spare Tire, TRANSMISSION: 9-SPEED 948TE AUTOMATIC 1 SPEED PTU (STD), ENGINE: 2.4L I4 MULTIAIR Tigershark (STD). 125-Point Inspection and Reconditioning, Local Trade, New Tires. EXPERTS CONCLUDE Great Gas Mileage: 28 MPG Hwy. SHOP WITH CONFIDENCE AutoCheck One Owner Rental Car Allowance, Lifetime Certified Warranty Upgrades Available, 24-Hour Roadside Assistance, 24-Hour Towing, 3-Month/3,000-Mile Maximum Care Coverage, 7-Year/100,000-Mile Powertrain Limited warranty, Introductory 3-month subscription to SiriusXM® Satellite Radio MORE ABOUT US At Waconia new and used Chrysler, Dodge, Ram and Jeep dealership. Has been a locally owned and operated family business since 1965. We strive to exceed your expectations. With a knowledgeable sales team, large inventory and everyday low prices, Waconia is the only place you will need to shop for a new or used car by Chrysler, Dodge, Ram or Jeep. Pricing analysis performed on 3/9/2019. Horsepower calculations based on trim engine configuration. Fuel economy calculations based on original manufacturer data for trim engine configuration. Please confirm the accuracy of the included equipment by calling us prior to purchase. Jeep Certified, Excellent Condition, LOW MILES - 10,736! EPA 30 MPG Hwy/22 MPG City! Back-Up Camera, 4x4, iPod/MP3 Input, Keyless Start, Bluetooth, Aluminum Wheels, SAFE & SECURITY GROUP, ADVANCED SAFETY & LIGHTING GROUP CLICK ME! SHOP WITH CONFIDENCE 125-Point Inspection and Reconditioning, Rental Car Allowance, Lifetime Certified Warranty Upgrades Available, 24-Hour Roadside Assistance, 24-Hour Towing, 3-Month/3,000-Mile Maximum Care Coverage, 7-Year/100,000-Mile Powertrain Limited warranty, Introductory 3-month subscription to SiriusXM® Satellite Radio KEY FEATURES INCLUDE 4x4, Back-Up Camera, iPod/MP3 Input, Bluetooth, Aluminum Wheels, Keyless Start. Rear Spoiler, MP3 Player, Privacy Glass, Keyless Entry, Steering Wheel Controls. OPTION PACKAGES TRANSMISSION: 9-SPEED 9HP48 AUTOMATIC, POPULAR EQUIPMENT GROUP Cluster 7.0 Color Driver Info Display, 115V Auxiliary Power Outlet, 7.0 Touch Screen Display, Rear View Auto Dim Mirror, Power 8-Way Driver/Manual 6-Way Passenger Seats, 4-Way Power Lumbar Adjust, ADVANCED SAFETY & LIGHTING GROUP Lane Departure Warning Plus, Auto High Beam Headlamp Control, Bi-Xenon HID Headlamps, Rear View Auto Dim Mirror, SAFE & SECURITY GROUP Rain Sensitive/Intermittent Wipers, Blind Spot & Cross Path Detection, ParkSense Rear Park Assist System, Security Alarm, ENGINE: 2.4L I4 ZERO EVAP M-AIR W/ESS. Jeep Latitude with White Clearcoat exterior and Black interior features a 4 Cylinder Engine with 180 HP at 6400 RPM*. Non-Smoker vehicle, One Owner, Local Trade. EXPERTS RAVE It rides well on the road, with carlike steering and brake inputs Great Gas Mileage: 30 MPG Hwy. OUR OFFERINGS At Waconia new and used Chrysler Pricing analysis performed on 2/1/2019. Horsepower calculations based on trim engine configuration. Fuel economy calculations based on original manufacturer data for trim engine configuration. Please confirm the accuracy of the included equipment by calling us prior to purchase. Excellent Condition! 1 OWNER! Jeep Certified! Leather, Back-Up Camera, Satellite Radio, Onboard Communications System, iPod/MP3 Input, ENGINE: 2.4L I4 MULTIAIR, TRANSMISSION: 9-SPEED 4WD AUTOMATIC. FUEL EFFICIENT 25 MPG Hwy/19 MPG City! CLICK NOW! KEY FEATURES INCLUDE Leather Seats, 4x4, Back-Up Camera, Satellite Radio, iPod/MP3 Input, Onboard Communications System, Aluminum Wheels. Rear Spoiler, MP3 Player, Keyless Entry, Privacy Glass, Steering Wheel Controls. OPTION PACKAGES ENGINE: 2.4L I4 MULTIAIR Tigershark, TRANSMISSION: 9-SPEED 4WD AUTOMATIC 2 speed PTU (STD). Jeep Trailhawk with Bright White Clearcoat exterior and Black interior features a 4 Cylinder Engine with 184 HP at 6400 RPM*. One Owner, 125-Point Inspection and Reconditioning, Local Trade. EXPERTS CONCLUDE Great Gas Mileage: 25 MPG Hwy. AFFORDABLE Was $24,988. This Cherokee is priced $1,100 below Kelley Blue Book. BUY WITH CONFIDENCE Rental Car Allowance, Lifetime Certified Warranty Upgrades Available, 24-Hour Roadside Assistance, 24-Hour Towing, 3-Month/3,000-Mile Maximum Care Coverage, 7-Year/100,000-Mile Powertrain Limited warranty, Introductory 3-month subscription to SiriusXM® Satellite Radio WHO WE ARE At Waconia new and used Chrysler, Dodge, Ram and Jeep dealership. Has been a locally owned and operated family business since 1965. We strive to exceed your expectations. With a knowledgeable sales team, large inventory and everyday low prices, Waconia is the only place you will need to shop for a new or used car by Chrysler, Dodge, Ram or Jeep. Pricing analysis performed on 2/1/2019. Horsepower calculations based on trim engine configuration. Fuel economy calculations based on original manufacturer data for trim engine configuration. Please confirm the accuracy of the included equipment by calling us prior to purchase. Excellent Condition, Jeep Certified, GREAT MILES 8,501! REDUCED FROM $28,287!, PRICED TO MOVE $700 below Kelley Blue Book!, EPA 30 MPG Hwy/22 MPG City! Heated Seats, iPod/MP3 Input, Back-Up Camera, Keyless Start, Bluetooth AND MORE! KEY FEATURES INCLUDE 4x4, Back-Up Camera, iPod/MP3 Input, Bluetooth, Aluminum Wheels, Keyless Start Rear Spoiler, MP3 Player, Keyless Entry, Privacy Glass, Child Safety Locks. OPTION PACKAGES TRANSMISSION: 9-SPEED 9HP48 AUTOMATIC, POPULAR EQUIPMENT GROUP Cluster 7.0 Color Driver Info Display, 115V Auxiliary Power Outlet, 7.0 Touch Screen Display, Rear View Auto Dim Mirror, Power 8-Way Driver/Manual 6-Way Passenger Seats, 4-Way Power Lumbar Adjust, COLD WEATHER GROUP Heated Front Seats, Reversible Carpet/Vinyl Cargo Mat, Windshield Wiper De-Icer, All-Season Floor Mats, Heated Steering Wheel, ENGINE: 2.4L I4 ZERO EVAP M-AIR W/ESS. Non-Smoker vehicle, Originally bought here, One Owner, 125-Point Inspection and Reconditioning. AFFORDABLE Reduced from $28,287. BUY WITH CONFIDENCE AutoCheck One Owner Rental Car Allowance, Lifetime Certified Warranty Upgrades Available, 24-Hour Roadside Assistance, 24-Hour Towing, 3-Month/3,000-Mile Maximum Care Coverage, 7-Year/100,000-Mile Powertrain Limited warranty, Introductory 3-month subscription to SiriusXM® Satellite Radio OUR OFFERINGS At Waconia new and used Chrysler, Dodge, Ram and Jeep dealership. Has been a locally owned and operated family business since 1965. We strive to exceed your expectations. With a knowledgeable sales team, large inventory and everyday low prices, Waconia is the only place you will need to shop for a new or used car by Chrysler, Dodge, Ram or Jeep. Pricing analysis performed on 4/10/2019. Horsepower calculations based on trim engine configuration. Fuel economy calculations based on original manufacturer data for trim engine configuration. Please confirm the accuracy of the included equipment by calling us prior to purchase.